Ernie Els Design is proud to announce that its Design Associate Thad Bell has been awarded membership of the American Society of Golf Course Architects. 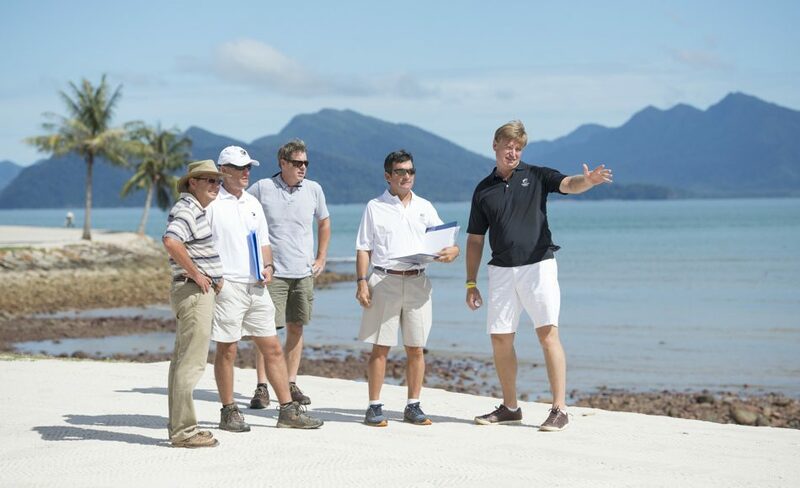 Thad (pictured above, second from left, on a site visit with Ernie to The Els Club Teluk Datai) has been part of the team at Ernie Els Design since 2006, when he directed the implementation of the award-winning Anahita Four Seasons golf course on the island of Mauritius. That course has since hosted several professional tour events including the 2016 AfrAsia Bank Mauritius Open, the first ever tri-sanctioned tournament by the European Tour, Asian Tour and Sunshine Tour. Thad is now leading Ernie Els Design’s expansion into Asian golf as the Regional Director of the company’s Asia-Pacific office. He becomes the second member of the Ernie Els Design team to become a member of the ASGCA. The company’s Senior Design Associate Greg Letsche is already a member. Foster the game of golf, its growth and advancement. Foster professionalism of ASGCA members through education, promotion and fellowship of the world’s leading golf course architects. Support design excellence by creating golf courses that are technically, strategically and aesthetically excellent while meeting the economic, environmental and other needs of golf course owners, developers and communities. Expand the opportunities of ASGCA members to better serve their clients and the game of golf. Ernie Els Design’s portfolio of golf courses has a global dimension. Currently, there are 15 courses and renovations open for play and at least the same number again in various stages of planning and construction. Please click here to see the full list of projects. For more information on the ASGCA, visit the website: https://asgca.org.